Half the blueberries if you can, or lightly chop. 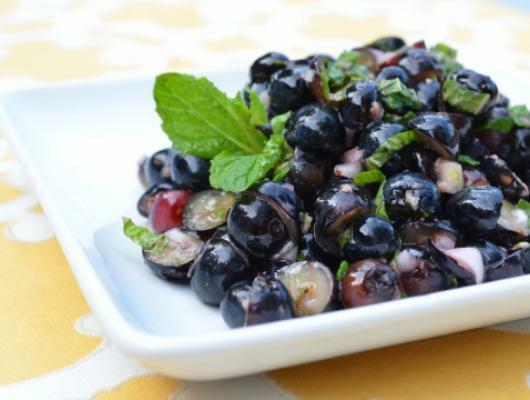 Toss together the blueberries, shallots, ginger, and mint. In a bowl whisk together the lemon juice, olive oil, and honey. Toss the lemon oil with the blueberries and season to taste with salt and pepper. This is definitely one of those recipes you can prepare to taste. A little more ginger, a little less mint or maybe a little more honey. Whatever you decide, it’ll be delicious! I love this fresh and flavorful salsa over grilled white fish; halibut, black cod, Hawaiian opah and grilled scallops. 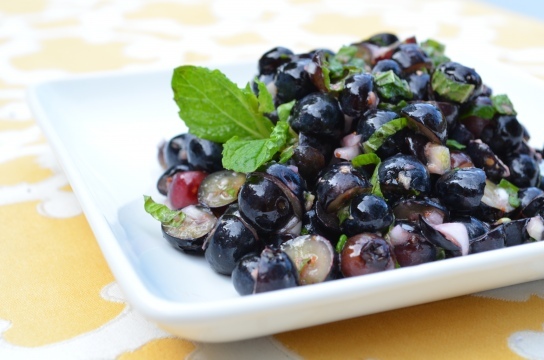 A savory blueberry salsa combined with spicy ginger, fresh mint or cilantro, aromatic shallots and perfect over grilled fish or poultry. A lovely summer dish.